more of the night HE came home"
"A Halloween night of terrifying butchery; a convicted killer on the loose; a frenzied chase after an unstoppable murderer - these are the harrowing ingredients of the follow-up to John Carpenter's sensational hit. Once again Michael Myers pursues the beautiful teenager Laurie and satisfies his bloodlust with random slaughter: loving couples, a defenseless nurse, a luckless guard and many more fall prey to Myers as he weilds axe, breadknife and even medical syringe in his relentlessly violent quest." " Didn't your hear? Some girl got killed up in Haddonfield." I hadn't yet seen the original HALLOWEEN, so could only guess the kind of terrors Jamie Lee Curtis' Laurie Strode character had suffered previously, but the brief recap of that film's climax hinted more than enough to set the scene - with Laurie sending the two children screaming out of the house and down the road; a reanimated Michael Myers sitting up in the background, and Donald Pleasance's Dr. Loomis seemingly saving the day by shooting the shape repeatedly until he fell backwards over the balcony and into the darkened garden below. Of course, the 'shock' ending that Myers body was missing - leaving nothing but a pool of blood in the imprint on the grass - was just this film's beginning. Pleasance, hamming it up for all his worth, staring incredulously at the neighbour who had come outside to see what all the fuss was about, "Is this some kind of joke? ", he insists, "I've been trick or treated to death tonight! "; Loomis fires back, "You don't know what death is!". ... Cue the start of Carpenter's updated, funkier score and the slow zoom in on the glowing pumpkin, as the opening credits roll. That the pumpkin slowly splits apart to reveal a shadowy skull lurking within was almost too much for the twelve year old me, I seem to remember. I was in horror movie heaven; that mixture of awe and strangely pleasurable dread is a rush I've sought in every horror film I've ever seen since. A confirmed horror movie junkie was born. Although HALLOWEEN II is ostensibly the continuation of the night "HE came home", to these now veteran eyes this is a 1981 slasher flick through and through. The subsequent scenes of Michael stalking the shadows and backyards of the inhabitants of Haddonfield, as the police arrive noisily nearby, is nicely evocative; his omnipresent heavy breathing filling the night. He steals a carving knife from right under the nose of an old woman, who has taken a break from fixing herself a sandwich to watch the breaking news bulletin as the authorities make the grisly discovery of three bodies in a house nearby (those of Laurie's friends from the first film - in fact, Nancy Loomis reprises her role of Annie briefly as her own corpse!). Her scream, as she discovers fresh blood on her bread board, alerts a young woman across the way, who is on the phone to her friend, who tells her about the grisly discoveries just down the road from her. Myers wastes no time in putting his new acquisition to work. Appearing suddenly from the dark (in the film's best jump scene), he grabs her; his dead eye momentarily studying her before bloodily burying the blade in her neck. An understandably exhausted Laurie Strode is taken to the local hospital (where the majority of the subsequent film will take place). Now, it's often said that the film's major weakness is the fact that her character spends the first 3/4's of the film either hysterical or, more often than not, unconscious and sedated. Whilst this is believable for her character, and what she had been through, it does mean that most of the film has to be carried by a cast of new characters, most of whom we just know won't make it to the final reel. You have to wonder what kind of film it would have been if Myers actually returned to Haddonfield after three years and stalked a recovered Laurie ... Also, watching it this time, it surprised me, that whilst Dr. Loomis is in the film at regular intervals - trying to convince the police that Myers is still very much a clear and present danger - he is relegated to more of a supporting character. The main bulk of the first half of the film is taken up with introducing us to the nurses, orderlies and one doctor at Haddonfield General, and their reaction to the admittance of Laurie Strode and the events of earlier that night. Now, 1981 just wasn't a good year to find yourself incarcerated in a hospital (VISITING HOURS and X-RAY also persuaded people to stay away in droves!). Myers, ever the perfect boogeyman, looks fantastically creepy as he stalks the shadowy hallways of the curiously near deserted hospital, unseen except by the ever present CTV, which captures the fleeting and menacingly silent shape momentarily. There's one great scene where Myers stands unseen in the incubator ward, watching the nurses; juxtaposing his fathomless evil with the gurgling innocence of the babies around him (for one horrible moment I wondered if we were going to see wholesale infanticide, but even in the 'video-nasty' early 80's this piss-pot massacre thankfully didn't come to pass). Although it's Laurie Strode he has set his eyes on he's more than happy to whittle away the staff as a starter course. Ever resourceful, he makes short work of them with syringes to the eyeball and the temple; one is garroted; a buxom nurse is scalded to death in a boiling jacuzzi (flinched from either Argento's DEEP RED (1975) or the Jaclyn Smith thriller NIGHTKILL (1980)); a security guard gets a pick axe in the head; and one nurse - in a death scene which stretches credulity to breaking point - is drained of all her blood on an operating table. Reportedly, Carpenter 'gored up' some of these murder scenes after complaints that Rosenthal's cut just wasn't scary enough (he was probably also well aware that in 1981 suggested violence just didn't cut it with modern audiences). Rosenthal reputedly shot back that this ruined his carefully paced film, which he had purposefully modeled on the first movie. The truth is, of course, open to debate. HALLOWEEN II only truly kicks into gear when a still drugged and injured Laurie and Myers finally set eyes on each other (in a memorable moment he stabs a nurse in the back in front of her and lifts her off her feet with the scalpel handle, as Laurie attempts to flee down a corridor). Rosenthal manages to generate and sustain palpable tension as Myers follows her down into the basement. The shots of him walking slowly down steps, scalpel in hand, chillingly capture his dogged determination to destroy - it's vintage Myers. Finger nails are duly bitten as Laurie struggles to close lift doors as Myers advances (but makes not effort to speed up, which just makes him even more frightening); also, when her hiding place in the car park is given away when a concussed victim falls against the horn, the blare of which alerts Myers and he follows her across the car park as she attempts, but fails, to alert Loomis and Nurse Marion Chambers (Nancy Stevens), who have just turned up to save her. It all ends with that hoary old classic: the purifying flames. Myers making one last attempt to get Laurie, before collapsing and being consumed in fire (I can buy Myers surviving - after all, the boogeyman never dies - but the fact Loomis turns up in subsequent sequels with only a small bit of facial scarring meant that disbelief had to be permanently suspended). The coda, where Laurie, in the ambulance is surprised by what the audience take to be a yet again reanimated Myers but actually turns out to be the concussed orderly Jimmy, is missing from the cinema print but regularly appeared on the TV print (in the cinema and subsequent video versions we just presume he died). 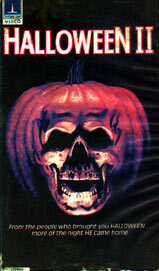 Regardless, although HALLOWEEN II will always suffer in comparison with the first film (Carpenter's HALLOWEEN is perhaps the perfect horror movie: a breathtakingly simple, beautifully sleek shock machine), judged alone (a tall order I know) it's sequel is still a small classic in the early 80's slash arena.